Pick a large lightweight wood or plastic bead for the base of this fun project. Since my wooden bead was painted blue, I decided not to fight against fate, but picked a good selection of blue beads in various sizes for most of the covering. I also threw in some contrasting beads for fun! 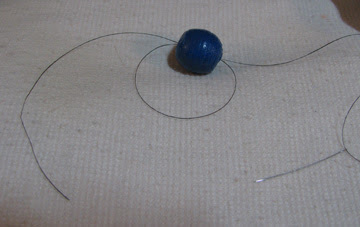 1 Loop the thread through the hole of the large bead several times, and tie a knot. These threads will be covered as you work. 2 String on beads to reach from hole to hole, tie off at the top, go back through the hole and repeat several times. 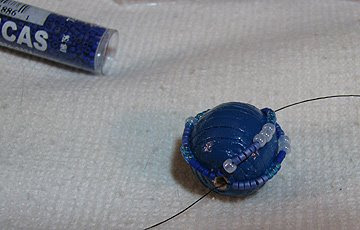 3 Begin to weave beads off of the foundation strings, using peyote, square stitch, or whatever you wish. I used peyote. 4 When all the strings are several rows of beads wide, begin to connect from string to string with peyote stitch. 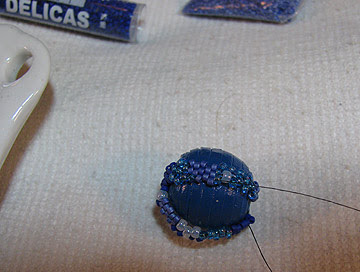 5 Use different sized beads to fill in all spaces except for the hole through the large bead. 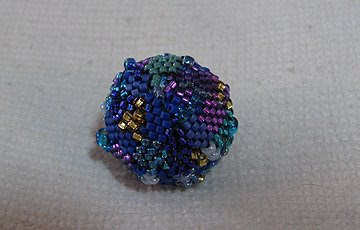 6 Here are a few shots of the finished bead from different angles. It's hard to see the hole through the large bead, but it is still there. You can now add a wire through the hole to create a pendant, or you can string the large bead as part of a necklace. Cool. Thanks for sharing. I'm eager to try this. I'm going to give you a warning then...run away, run away, while there's still time!! LOL! És preciòs. Moltes gràcies. M'ha agradat molt. Thank you for your visit, Carmen! I'd have a big balled mess. You make it look easy and the instructions are very clear. I'll give it a try. I'd love to see what you make, Susan! Cyndi, these are really cool. 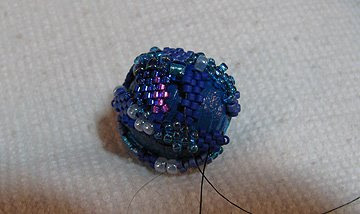 I haven't tried beaded beads, and I am looking for inspiration to teach a class of homeschoolers some basic stitches. Stumbled onto your site, and oh my, now I have something for me to try! Hi, my name is Stephanie, I know this is four years later. 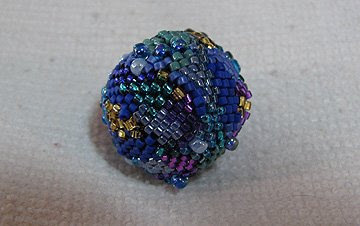 I just found your website by looking for beaded bead images. I was very interested in this way of covering wood beads. My questions are, when you say go through the bead several times in line number one then, you say string beads on the thread and go though the bead several times on the second line. does this mean to do two things?Wrap several strings, then string several strings with beads and tie knots on each string? thank you so much. Hi Stephanie! Yes, you've got it exactly right. First just wrap the bead with several rounds of thread and knot it. It will be covered up by the following steps. 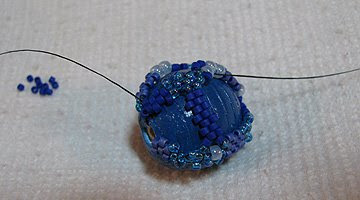 The next step is to wrap the bead again, but this time add beads to each wrap. I think it's a good idea to knot each wrap this time. I'd love to see what you make! Janet, that's not a silly question at all! You've got several choices. You could simply tie a few knots in between beads and then hit them with a dab of cement (I use G-S Hypo Cement for this). Or you could weave your thread end back and forth through the work enough times to insure that it won't pull out. Or you could be really compulsive and do both! I usually do the "weaving" or the "both" method. For this one, just weaving, because there's not much movement or stress that the piece will go through once it's finished.